MOSCOW, August 10. /TASS/. Yemen’s government troops, which do not control a sizeable part of that country’s territory, will hardly storm the biggest port city of Hodeidah held by Houthi rebels, Russian Ambassador to Yemen Vladimir Dedushkin told TASS. The diplomat noted that, although Yemeni politicians and military officials often make statements on the upcoming assault on Hodeidah, there is a huge distance between public promises and specific actions on the ground. "Sober-minded politicians, both Yemeni and foreign, do not believe in a massive assault on Hodeidah," the ambassador went on to say. "Military experts tend to believe that the Houthis can only be fully driven out the city at the cost of its complete destruction." Dedushkin noted that by now the fighting for Hodeidah had become a trench warfare despite air support for the Arab coalition. It takes place on the city’s fringes, about 15-20 kilometers away from its borders. "The assault would inevitably lead to the destruction of the biggest and only deep-sea Red Sea port, which receives 80% of cargo, including humanitarian, for the majority of the population," he added. According to the UN, there are about 350,000 refugees in Hodeidah, so the assault on the city would be a humanitarian disaster, the ambassador stressed. "Turning one of the most beautiful cities of Yemen and the Red Sea into ruins similar to Stalingrad or Raqqa and Mosul would be lunacy," he pointed out. "The press service of the Russian Foreign Ministry and Russian representatives to the UN Security Council have stated that on numerous occasions." "I would like to hope that a step towards a peaceful solution on Hodeidah will be taken at the intra-Yemeni consultations brokered by UN secretary-general’s special envoy for Yemen Martin Griffiths scheduled to be held in Geneva in September," Dedushkin noted. Since August 2014, Yemen has been embroiled in a conflict between its authorities, which the global community recognizes as legitimate, and rebel groups, which were earlier backed by the forces loyal to ex-President Ali Abdullah Saleh. 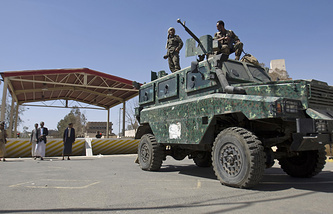 The conflict reached its boiling point following the invasion by the Saudi-led coalition in March 2015 at the request of incumbent Yemeni President Abd-Rabbu Mansour Hadi. Houthi rebels currently control the country’s capital city of Sanaa and the biggest Red Sea port of Hodeidah.